Soya chunks paratha is also known as Soya kheema paratha. Originally kheema paratha is an unleavened flatbread stuffed with spicy minced meat. Instead of meat, I used spicy soya chunks filling in paratha. Soya kheema paratha or veg kheema paratha is very tasty, high in nutritional values and a popular Indian breakfast. Soya kheema paratha is a protein-rich breakfast and great for kids lunchbox tiffins. 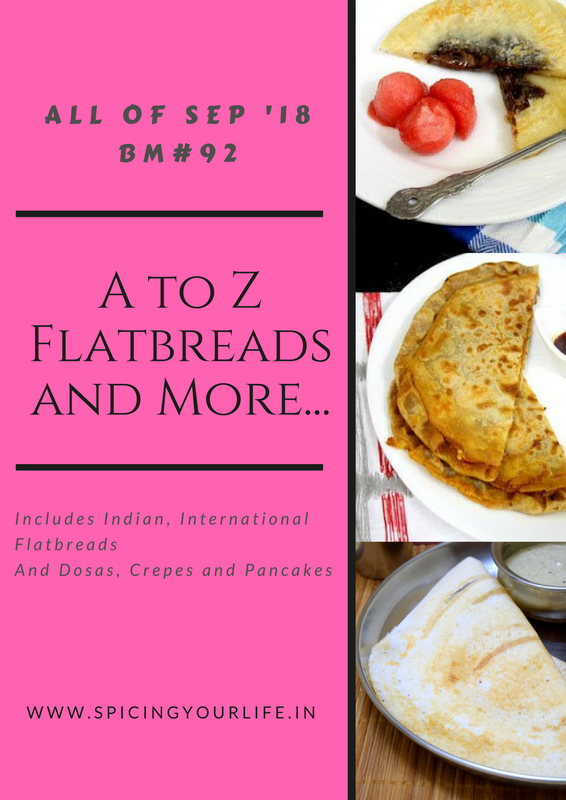 Stuff parathas make a great meal with dip, curries or just simple curd is enough. Make sure that dough is soft and smooth, and filling is an equal amount of the dough ball. This is the best way to make great stuff parathas. To make this soya kheema paratha first I simply grind the soya chunks which gives a coarse powder. Do not over grind, few pulses are enough to get a coarse powder. Temper with chopped onion, kasoori methi and few spices. Adding soya coarse powder with some water cook for few mins and soya kheema filling is ready to stuff. So let see how to make this delicious, lip-smacking soya kheema paratha. Add soya chunks in a grinding jar and pulse for 3-4 seconds. You will get a coarse powder. Do not over grind it to get a smooth fine powder. Heat oil in a non-stick pan on medium flame and add oil. Once the oil is hot add cumin seed, let them crackle. To this add grated ginger, garlic, and chopped green chilies. Stir it until garlic is golden brown in color. In addition to this now add asafoetida and chopped onion. Cook it until onion turns to golden brown. This takes 3-4 minute. When the onion is golden brown add kasoori methi, red chili flakes, and kitchen king masala. Mix nicely. Finally, add soya chunk’s coarse powder and give a nice stir. Add 1 cup of water and salt as per taste. Mix nicely and cook for 2-3 minutes on low flame by covering lid. After 3 minutes add chopped green coriander and mix. Soya kheema filling is ready to stuff now. Spread it on a plate to cool down. The filling should be at room temperature. Soya kheema paratha or soya chunks paratha is ready to serve hot with curd or pickle or any chutney. This soya chunk paratha tastes great when served hot. Be careful while making a coarse powder. You can also use soya granules to make this paratha. Adjust chilies as per taste. This quantity was good enough as my son didn’t complain about it. he does not like chilies in his food. While rolling soya filling can come out, just seal it and proceed. I also always add flax meal to my roti dough. That is a lovely stuffed paratha and very nutritious as well. Great option for lunch box. yeah, I find this easy to consume flax seeds. Thanks for liking soya kheema paratha. I too made use of soya kheema in the series and though I am not a big fan of this, wanted to use it for the letter..your parathas are looking very good and if everybody likes it, then this is one filling parathas! yeah, soya parathas are loved at my home. adding so many spices surely makes it delicious. Lovely use of soya in paratha. Such a healthy one. Kids would simply love this. Thanks Renu for liking soya granules paratha. Same pinch Bhawna! I too made these but cooked and minced the soya chunks. Must try your version too. Thanks PJ for liking soya chunks paratha recipe. I’m not a fan of soya but must say your parathas have come out perfect…can even tempt me to try them. Thanks, for appreciating soya kheema paratha recipe. Even though I am not a great fan of soya , I like these heavily stuffed parathas . They look loaded with soy qeema and would make such a healthy meal . even in my childhood I never liked soya chunks or soya granules. But after blogging it is my favorite. My son love it too. Soya is the perfect substitute for meat in recipes. This version of the kheema paratha looks fantastic and with the spicy filling they don’t even need a side dish. Yum.. Very inviting those soya kheema parathas looks, never said no to this protein rich kheema paratha, one of my favourite vegetarian kheema paratha.. Drooling here already. Thanks dear I am glad you liked. It is my son’s favorite paratha so far in this BM. Love the addition of flax seed powder in the dough. and the soya filling would be so flavorful and tasty! Nice pick!! Thanks Sowmya, yeah I keep adding flax seed powder in roti or paratha 4 times a week. That is definitely a healthy paratha and it is double dhamaka if the kiddo likes it, right? yeah Harini even it surprises me because as a kid I never liked this soya chunks or granules.but my son loves it. yeah even my son is crazy for these soya chunks or granules. It surprises me because as a kid I never liked it. But good. Now I will start exploring more for soya recipes after this BM. Great tasty option for vegetarians. The presentation of the post is awesome! Wonderful recipe. Will definitely try this.